What do you get when you combine the proven championship bloodlines of Peruvian Accoyo Mr. President with the proven championship lines of Peruvian Dakotia? You get an awesome brown male named Peruvian Fagan with a wonderful, tight, deep crimping fleece that is soft to the hand. His dam is Peruvian Faberege, the light brown daughter of Peruvian Accoyo Mr. President. Faberege is a gorgeous female and a champion and multiple blue-ribbon winning female in her own right. His sire is Peruvian Dakotia, who was lost in the 2003 Land O' Lakes feed poisoning tragedy. The offspring of Peruvian Dakotia have made him a legend. Dakotia produced other males who stand on Magical's Herdsire Row such as the famous Peruvian Jericho, Peruvian Equador, and multi-champion MFI Peruvian Natural High who sold in the 2006 Breeder's Choice Auction to Tiskilwa Farms. Another Dakotia son, multi-champion MFI Pistol sold in the 2006 Breeder's Choice Auction for $230,000 to Slate Ridge Alpacas. The consistency of the Dakotia line is unmatched and Fagan stands proudly representing it! Fagan's first crias began arriving in 2007 -- they are colorful and absolutely gorgeous! MFI Carmel Coated is a offspring of Fagan and has taken 3 banners. Tiger Lilly has been the picture of production consistency for years. Her offspring have won multiple championships and ribbons. Her color genetics are strong, delivering consistent black and dark brown crias. Tiger Lilly Julie, from Magical Farms' stellar breeding program, is packed with top of the line color genetics...MFI Peruvian Fagan, Faberege, Dakotia, Bueno and Panamalpaca Tiger Lilly. Her bloodlines have delivered consistent champions and blue ribbon winners! 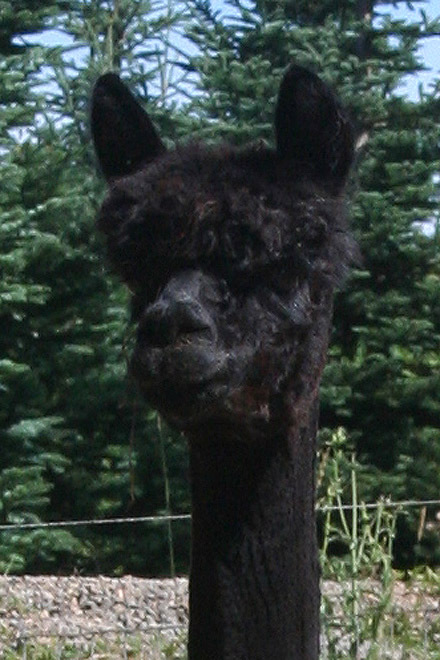 Julie is a classic black with an extremely fine, bright fleece. Her seven year fleece stats are outstanding at 21 micron with an SD of 4.6. Retained fineness and uniformity are her strengths. In addition to her fabulous fleece, this female has great bone structure with perfect conformation. She is a great mom, with lots of milk and easy birther. Her sire, MFI Peruvian Fagan is a Reserve Champion and mutiple blue ribbon winner in his own right, borrowing from his Dakotia and Faberege lineage. Julie's dam, Panamalpaca Tiger Lilly produced multiple champion offspring and has reliable, consistent color genetics. Tiger Lilly was one of Magical Farm's favorite dams. 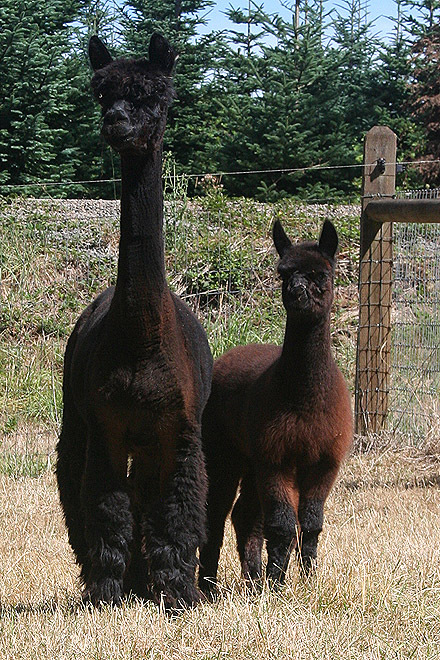 Julie's strength of color genetics came through in her first cria, an incredible black male, Jackson. 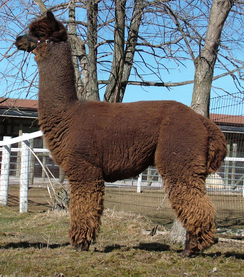 Sired the famous My Peruvian Obsydian, he is full of fleece, with incredible fineness and staple length. He inherited his parents fine, bright fleece, with fiber stats for his first fleece at 19 micron. Jackson with his blue black fleece, sold at 12 months of age. 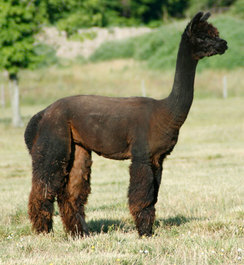 Julie's second cria, Madrone, a gorgeous fawn male sired by Neversummer's American Iron was sold as a herdsire at 16 months. Madrone also had excellent fiber stats, very fine with long staple length. Julie's 2016 breeding to WP Johnny Cash, with his Man In Black genetics produced a stunning black male cria born in June 2017. This male, Wenge, is gorgeous with jet black, fine, dense fleece and perfect conformation. This boy is amazing. No surprise that he sold at 9 months of age. Julie not only passes beautiful uniform color to her offspring, but also an extreme fineness and soft hand. We love her, but we've decided to focus on white/lights in our huacaya program and want to move Julie to a black/color breeding program that can take advantage of her retained fineness and uniformity.